As I was biking through Western Washington University campus, I noticed the rainbow flag flying proudly. 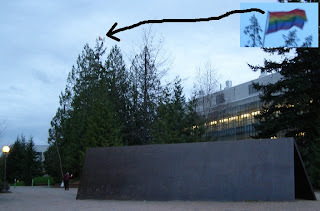 On top of a tall tree in front of chemistry and biology buildings. Must be a story behind that, but I haven't heard the story. Not sure if it's "official" or not. Rainbow banners have been official along Davie Street in Vancouver, BC and they look nice. Rainbow flag related to gay community. Then a friend of mine is traveling in Peru, South America. A rainbow flag flies high over the cathedral in Cusco. It's the official flag of Cusco long before it became an international symbol for gay parades. He says Cusco is talking about changing it's flag.